What is the silver ball / spring in my shaker for? Take the silver ball / spring out of the plastic bag and pop it back in your shaker. The shaker ball should stay in the shaker when you add your Nutribuddy powder and liquid to the shaker. During the shaking process the ball bounces around and helps to mix your shake making it as smooth as possible. For minimum fuss, simply leave the mixer ball in the shaker as you drink your Nutribuddy too. If you watch the video below closely, you can see the shaker ball remains in the shaker the whole time. 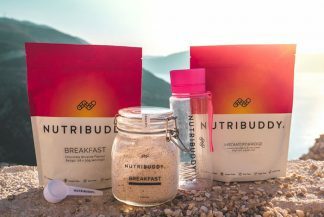 Every Nutribuddy product is covered by our 31-day Happiness Guarantee. As with other products, seek professional advice before using if you suffer from food allergies, and consult your doctor or pharmacist if you have an underlying medical condition (e.g. diabetes, epilepsy, hyperthyroidism), or if on medication.